Part six?! My goodness, so many great housing items! 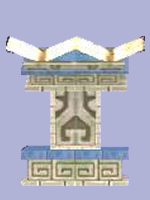 This post covers the last four housing objects from Cantares, the empty sarcophagus, obscure codex, tool rack and gold azteca column. Cantares says he's going to miss our visits and hopes that we'll stop by from time to time to save him from those pesky monquistadors. 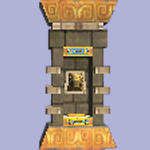 This beautiful column is the same as the azure one we covered earlier...only gold! You will need 8 Stone Block, 8 Sandstone, 5 Golden Pearl, 4 Fossil, 4 Sunstone, 20 Ore, 4 Agave Nectar and 20 Bone to craft each as well as 33,750 gold for the recipe, pretty simple right? 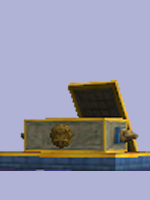 Since I first visited Dezzy while she was questing in Azteca I have LOVED the sarcophagi that you pass by and how I wished that I could have my own at home, sometimes wishes DO come true! Cantares charges 31,500 for the recipe and then you'll need 1 Wraith(tc), 1 Rebirth(tc), 8 Stone Block, 8 Sandstone, 2 Spooky Azteca Head and 2 Ornate Mask. I wish they were easier to make, I want a few. 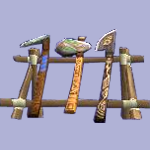 Yet another weapon rack. Yay. I suppose it could be cool to collect them all. This one will take 31,500 gold, 10 Pristine Vial, 5 Sandstone, 10 Mist Wood, 4 Agave Nectar, 4 Stone Block, 15 Leather Straps and 25 Spider Silk. At least most of it is simple and cheap. This just screams Aztecan temple and makes me want to build a pyramid out of Azteca castle blocks with a secret passage way leading to a sacred space add in the alter and you're on your way. It doesn't require too much, 1 Elemental Shield(tc), 1 Spirit Shield(tc), 5 Stone Block, 5 Sandstone, 20 Ancient Scroll, 4 Sunstone, 5 Agave Nectar and 4 Fossil. Time to say good bye to Cantarez, for now at least. Any suggestions for the next item or world you want me to cover? Comment below and I'll pick one! Until next time everyone, happy crafting!